Fields left empty do not appear in the display. Only the Full Name field is required. Full Name. At the top of the text entry area, enter your full name to use as the title for your Member Profile. This field is required. First Name. Enter your first name in the next field. Enter the first name to allow secondary sorting in lists. This field is not displayed. Add the middle initial or middle name if needed to ensure proper sorting (for example, to cause "Thomas F. Torrance" to sort after "Thomas Torrance"). Do you see the text entry guidelines in small print beneath the field? Look for these text entry tips before entering text in any field. Last Name. Enter your last name. Again, do you see the text entry explanation, located just beneath the field? Professional Title. What is your current position? What title is most descriptive of what you currently do? Or, what is the title held by this person in their main institutional affiliation? 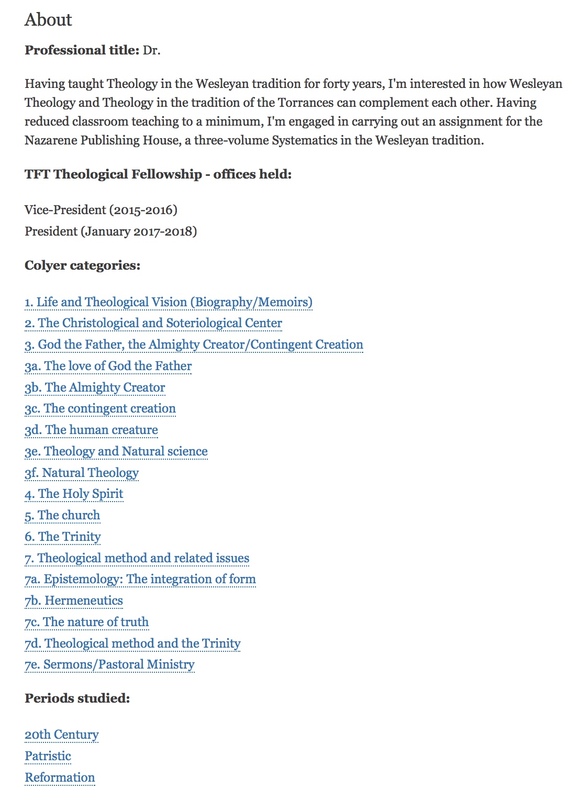 Assistant Pastor, Dr., Reverend, Professor of Christian Dogmatics, Author, etc. Other blocks have their own Notes fields. Information may presented in this About Me field in a unified note, or be parsed between this field and the other separate note fields (Education, Institutions, Activities, Reference). Whether you combine them here or split content between these fields is up to you. TFTTF service notes. A short explanatory note of service may go here; or, if substantial, in the About field. Colyer categories are thematic headings taken from Elmer Colyer's Reading Guide. By selecting a Colyer Category, this profile becomes accessible from that section of the Reading Guide. This is the "Colyer Category" taxonomy field. For any taxonomy field, enter a word or two, and then wait to see if the desired term appears as a possible selection. When the desired term appears, enter it in this field. This is the "Periods" taxonomy field. For a taxonomy field, enter a word or two, and then wait for the desired term to appear. The available periods are: 20th Century; 19th Century; Early Modern; Reformation; Medieval; Patristic; New Testament; Old Testament; Other. Describe here any interests you have on which you might welcome inquiries about from other members. It might relate to a work-in-progress where you would welcome input, or it might be an area in which you have published where you would not be annoyed if a young scholar asked for your input on their work-in-progress. Think of this field, in combination with other profile information (e.g., Colyer Categories, Periods Studied), as an opportunity for members to be of mutual service as a geographically distributed community of scholars. Enter McGrath numbers of Sources or Studies that pertain directly to your current research project. This will create a block of shortcuts to those bibliography records, and will also help others interested in the same works to discover that you share a common interest in a given work.